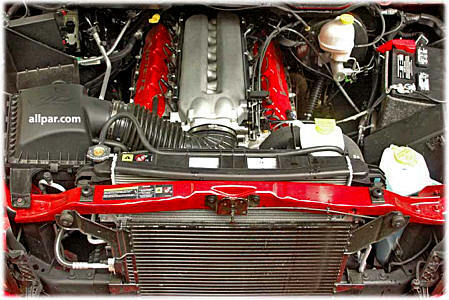 The Dodge Ram SRT-10 is more than just a Ram with a Viper V-10 shoved into it; as with the other SRT's, the suspension was updated to handle the power and give extra cornering, without losing ride quality, and extra instrumentation was installed. With 500 horsepower and 525 lb-ft of torque, it is the fastest truck available, doing 0-60 in a reported (and credible) 5.2 seconds, with the quarter mile flashing by in 13.8 seconds. 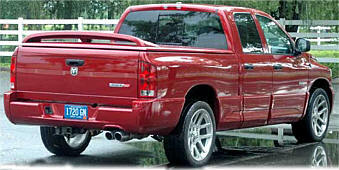 A little while after the original SRT-10 was built, using a modified Viper six-speed manual transmission and a standard cab in order to beat the Ford Lightning quite roundly (and still be able to tow a massive trailer), a new Quad Cab version was created, with an optional automatic transmission. With the automatic, the SRT-10 has a dual personality. The Viper engine is smooth and calm, easily controlled and giving the feel of an ordinary truck V8, as long as the throttle is kept in the usual operating range; the automatic reacts just like the standard Dodge truck transmissions. When the throttle is pushed down, though, the Viper heritage comes through, the engine power skyrockets, and the transmission shifts suddenly and jarringly to take full advantage of the power, and also to shift quickly enough to keep up with the rapid acceleration. In short, it behaves exactly as it should under both conditions - gentle and calm in normal driving, and performance-oriented in hard driving. The automatic transmission is the 48RE gearbox, adapted from a diesel engine because it could handle huge amounts of torque. A heavy-duty torque converter, custom transmission calibration, and two-piece drive shaft were chosen for powertrain integrity and performance. The axle gear ratio is 4.56:1 to improve launch feel, low-end acceleration, and towing capability (up to 7,500 pounds). The Viper engine sounds, well, like a Viper engine. Under normal driving, it gives a nice, deep growl, but isn't as loud as a Honda with a tin can muffler or a 2005 Corvette Z06. When the gas pedal is pushed down, depending on the demand, the growl escalates; under full throttle, it's a racing-car roar, with every one of those 505 horses making themselves well known. There's no mistaking the SRT-10 under full throttle; it clearly means business. That said, you can't stay there for long. Revving at idle brings an instant response; a quick blip takes the engine right to high rpm's. On the freeway, you get a scant few seconds at full throttle before the legal speed limit comes and goes in a blur, and trooper-attracting speeds are always close at hand. At highway speeds, the engine is always instantly responsive, with the transmission tuned for instant kick-down despite the enormous low-end grunt of the 8-liter V-10 under the hood. Based on a 360 cubic inch V8 engineered long, long ago, before the Japanese had made any real impact, the V-10 provides enormous torque even at low rpm. No wonder, then, that Dodge did not have to reduce the tow rating of the Ram when they created the world's fastest truck. Cornering is generally very good for a big rig, but by no means car-like; the Ram SRT-10 handles spurts of acceleration remarkably well, even on wet roads, but the heavy pickup body and adverse front-rear weight ratio certainly makes itself known around turns, especially under throttle. Generally, we were surprised by how well the Ram cornered and shocked at how well it dealt with power application; but it's also probably easy to become overconfident and end up facing traffic instead of passing it (not that we did that, Dodge fleet managers!). Part of the secret of getting so much power to the ground is the standard anti-spin differential, which seemed to be instrumental in keeping the tail from swinging out except under serious provocation (and, by the way, the tail came right back into line as soon as power stopped). The performance tuning of the suspension overall helped, as did the standard 22 inch tall by 10 inch wide aluminum wheels with low-profile 305/40R all-season tires (that's right, 305). 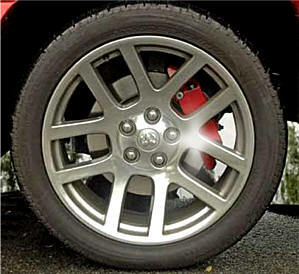 Our test truck had the optional polished aluminum wheels, but they were the same size as the standard rollers. Standard performance features in this truck include antilock four-wheel disc brakes, a heavier front stabilizer bar, performance tuned shocks all around, suede inserts in the form-fitting leather seats to keep everyone in place, and tighter steering. Standard luxury features are almost as extensive, including dual zone a/c, power six-way driver's seat, power windows and locks, cruise, tilt steering, heated front seats, in-dash six-disc, eight-speaker, 508 watt stereo with subwoofer, wheel-mounted audio controls, power heated foldaway mirrors, fog lights, cargo light, rear spoiler, and a hard, removable tonneau cover. So you know it's an SRT, a bunch of plastic stuff has been added to the nose, and a hood similar to that of the Ram Daytona - complete with scoop that directs cool air onto the top of the engine, but not into the intake - is used. 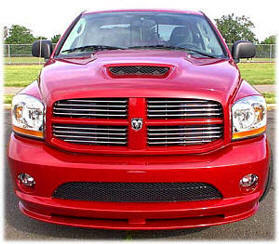 "Viper powered" plates decorate the sides of the hood scoop, and SRT-10 badging surrounds the truck. 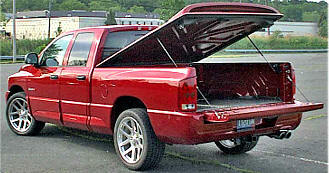 The hard rear tonneau cover helps aerodynamics and keeps the rear of the Ram cool looking; it lifts up on hinges and stays in place with hydraulic tubes, but taking it off requires two moderately burly and adept people (though to be fair it doesn't take long). A plastic bed cover, with SRT-10 emblazoned in huge letters, is standard. By the way, in case you were wondering, gas mileage is not as bad as you'd think. We achieved the EPA estimates of 9 city, 12 highway, about the same as the real-world mileage of other big pickups with big engines. On the down side, the Ram SRT-10 gulps premium. On the up side, it's actually one of the fastest SRT's, so you go to the track you can take on not just Mustangs and BMWs, but also SRT-4s. (Just remember to unhook the 12 foot trailer and get all that steel pipe out of the bed first). The Dodge Ram SRT10, with all that performance, in a heavy pickup form, with low-profile tires and a full seven thousand pounds of towing capacity, could be expected to have a punishing ride, but in fact it did not. The ride was certainly firm, but the shock absorbers were clearly there, doing their job. There was none of the heavy-duty-pickup jouncing and bouncing, and at the same time, there was none of the boy-racer, over-tight-shocks, big-wheel-with-tiny-tires Japanese-sport-compact jittering and stiffness. The Ram SRT10 was surprisingly easy to drive on rough city streets and broken cement pavement. If anything, it was more pleasant than a standard pickup. Visibility is surprisingly good within the limits of a pickup. The car blind spot in the rear quarter was minimized with a small roof post, but being high off the ground makes parking an adventure, and backing up quite dangerous to anyone around. Both should be done with more caution, and a parking alert system will probably start working its way through pickup trucks the way it has been working through luxury cars. Headlights are strong, mirrors large, wipers and defrosters effective. The white-faced gauges had sharp backlighting at night, making them easy to see day or night. Gauges were all sensibly placed, save for the AutoMeter oil temp gauge, inserted amusingly into the roof support for lack of any other reasonable place. 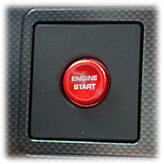 The "overdrive off" button has been replaced by a GM-like tow/haul mode button on the end of the column shifter; the lights are all together in a single pod, as are the climate controls. Finally, in a rather ostentatious move, the SRT team added an "engine start" button to the dashboard, so that you have to put the key into the conventional steering-column lock, turn the key to RUN, then press the button until the engine catches. Headlights are on the dashboard, with a large, traditional switch, in the same cluster as the dimmer and cargo light; in a similar sensible vein, the climate control features are all in one bunch, and the stereo/navigation system is set up as an easily replaceable square of standard size. The seats in our test vehicle were comfortable, grippy, and very adjustable, down to electrically adjustable pedal height. A switch on the dashboard makes it possible to bring the pedals up to your feet, or down to a comfortable depth. 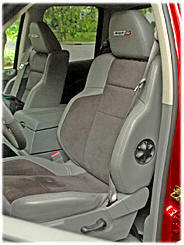 Rear seats are typical straight-backed pickup style, with decent enough legroom and good headroom. The middle seat is for occasional use only. The rear seats are high enough from the floor to be useful for adults. While the cargo and interior lights go on when you unlock the doors, there is no power memory - when you take out the key, the radio and power windows suddenly stop working. However, the standard trip computer mounted in the roof provides the outside temperature, compass bearing, and the average gas mileage. Our test car had the optional navigation system, at $1,600. In addition to providing simply superb sound, the navigation system proved to be surprisingly easy to use, because audio controls were not integrated into the navigation screen; instead, they remained as solid buttons, making it easy to change channels or adjust audio without taking eyes off the road. The navigation system itself had all the usual features, and indeed we've reviewed it in depth in other Dodge, Chrysler, and Jeep reviews. While not as flashy as the current Toyota system (which also allows faster data entry), it does have the advantage of dealing well with small roads that Toyota simply ignores. The center console has two deep layers, the top one having pop-up sub-dividers so that you can either store large things in it, or small things in separate compartments. It also has an internal power outlet and a sensibly designed, removable coin holder with no room for pennies. Another clever feature is storage room under the rear seats; yet another, the new, probably cheaper cup holders which, like their cousins in minivans, can hold large or small containers tightly. 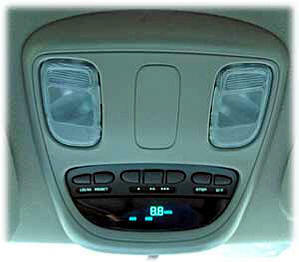 There are other little places to put coins, highway passes, and such in the dashboard and front of the center console, along with large map pockets and smaller odd-thing pockets in the front doors. We also liked the little touches - overhead lights that go on when you press them, the built-in, universal garage door opener (built into the trip computer) with room in its memory for three different garage doors or gates. While the heater is powerful and works quickly, the vent fan can be noisy - despite huge, square vent openings. The air conditioning did not seem to have any drag on the engine. The rear gate is far easier to lift than the Silverado's, and the cargo light seems to be more effective. However, there is no step built into the bumper, and it can be hard to launch one's self into the bed. ($600! 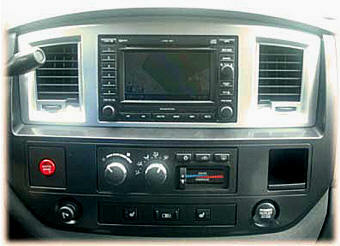 ), and, yes, believe it or not, a rear seat DVD player integrated into the roof, at a whopping $1,200. The Dodge Ram SRT-10 is clearly an unusual truck; what they have brought off is a vehicle nearing the performance of a prior-generation Corvette, with room for four (for real), and the ability to do serious towing or hauling work as well. In normal traffic, where the throttle never needs to go down very far, the Dodge SRT10 is docile, patient, and quiet; but it's always, and we do mean always, ready to spring forward with a deep roar and little fear of doing an unexpected U-turn. Given the price of gas it’s not for everyone, but the cost is well within reason for either performance cars or big pickups, and we think people who buy it will continue to enjoy it... as long as they're not in a hurry, because there are an awful lot of people out there who want you to stop and show it off.